The brief article tells a litte of João Kouyoumdjian's story and recommends his first CD Surfboard: Solo Guitar Works from Brazil. The english translation follows below. the state of São Paulo, where he was born 28 years ago. refined his studies with Paulo Martelli. eighteen years old; cellist Yo-Yo Ma; Itzhak Perlman and others. Kouyoumdjian won the spot in 2007 competing among 39 other candidates. the Horizontes do Violão (“Guitar Horizons”) project, in partnership with Juilliard. Back to the United States he presented concerts at Carnegie Hall and Kennedy Center. to record two CDs with world-wide release until 2015. The first, “Surfboard” is now getting out of the oven. 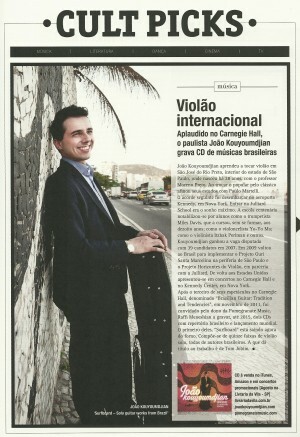 It consists of fifteen tracks of solo guitar, all by Brazilian composers. The track that borrows the CD’s title is by Tom Jobim.